ISOMA Cosmetic Concealers represent the various shades that the International Society Of Makeup Artists (ISOMA) feels are the most useful for today's varied skin-tones. This list of ISOMA concealers is provided as a guide to assist you in selecting ISOMA Cosmetic Concealers as your product of choice. These premium-quality concealers may be used alone or mixed together to create numerous custom-blended shades for a variety of skin-tones. ISOMA's premium-quality concealers are presented in an elegant, slim-line, fashion palette that is easy to open and close during leisure and quick time use. The palette fits conveniently in the artist's hand, set bag, accessory/brush holder apron, and makeup case. The palette features five of the most useful and highly desirable shades for a variety of skin-tones. ISOMA's exclusive formula possesses the perfect amount of color pigment for coverage and long wearing use . . . holding up for hours under a variety of conditions. The concealers glide on smoothly and enhance the total look of the makeup application by helping to conceal problem areas and creating an even, flawless-looking complexion. All five exclusive shades are conveniently placed in the same palette case and not in seperate containers, so that they may be quickly located, applied, or mixed to create additional shades that may be applied. These unique products were designed by professionals for professionals . . . An original ISOMA creation. The actual shades are not exact matches to the colors shown, due to the fact that the above colors are electronically reproduced. These sample colors and the below shade descriptions should be used as a guide in helping you to select ISOMA Cosmetic Concealers as your choice of concealer product. 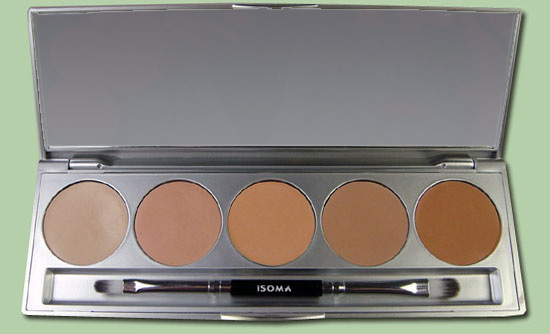 ISOMA COSMETIC CONCEALERS ARE ONLY $40.00 FOR ALL FIVE PALETTE SHADES. PROFESSIONAL MAKEUP ARTISTS RECEIVE A SPECIAL DISCOUNT OFF THE ABOVE PRICE, APPLY ON-LINE FOR YOURS TODAY..